Natural simplicity. Rustic comfort. If you want to see the exact definition of these terms with your own eyes, you’re going to have put Nest Tulum on your destination bucket list. And don’t say that I didn’t warn you – you’ll never want to leave! The name, Nest, was created for this place since it truly feels like a low-key, private getaway rather than a hotel. Bungalows set amidst tropical foliage. Torches in the sand guiding your way through the leafy palms of your own private jungle. Rustic chic architecture. Enchanting, dreamy, and so quiet that you can always hear the ocean. This is what sets the Nest apart from your average hotel. I’d heard wonderful things about this property, and after one of my good friends rented it out for her wedding, I knew I had to stay there. There are only eight rooms on the property (divided into four separate two story villas) and an open air restaurant/bar which is situated beneath the palms and sits on a pristine beachfront and common living area to enjoy breakfast and cozy lounges in the property. We spent most of our time there with no complaints. It doesn’t get more boutique than Nest Tulum. It’s very off the grid – one of the last properties in Boca Paila (the famous beach stretch of hotels and restaurants in Tulum) and on the less-developed south end, which makes it even more quiet and exotic. The entrance is hidden too, of course – we don’t want strangers to find us here. The mission is to relax, regenerate and blend in with nature. If you’re a fan of the tropical season and storms like me (that’s why I love going to Tulum towards the end of May/June), you’ll love the natural elements like the views, weather, and adorable spider monkeys. The lobby is a cute tiny hut. It’s also a great spot to take off your sandals off before starting down the dreamy, winding path to your room. You’ll fall in love immediately. We stayed in the Jungle Suite which is on the second floor of a villa and has two connected rooms. I think this is their best room for staying with a friend. And it’s now officially on my vision board as my dream place to live! The numerous hammocks in both rooms and the balcony (and a secret hammock loft that you can climb to with a ladder) and kilim rugs that cover up some areas of the concrete floors, amp up the rustic chic style. One of our favorite things about our room was that both rooms have amazing king size beds. Mine faced the doors that lead out into the balcony and I loved getting some work done on my bed with those doors thrown open. Every room at Nest is uniquely decorated and well-appointed with bohemian aesthetics. I wanted to steal the whimsical keychains! The dreamy beach beds and cabanas kept us cool in the shade while we were having our mojitos. The staff were very friendly and pleasant – one night I had a bad stomach and they were kind enough to prepare a fruit plate and green tea for me! The dinners are definitely worth mentioning too! Everything is made from scratch and you can even see the chef in action through the view to the little kitchen. We totally spied on him if you caught this funny moment on my Snapchat or Insta stories 🙂 Everything we had was super fresh and mouth-wateringly delicious, but the best part of having dinner here is eating and sipping your drink while listening to the sounds of the waves. My daily life is very stressful, and I’m always in a rush, so the relaxing dinner sessions at the Nest is something I already miss. An Instagram worthy moment is around every corner in this property but I definitely recommend long naps on the beach while listening to the sound of the waves and watching the moon rising over the ocean. You can always post on Instagram but you can’t always find this tranquil atmosphere in your daily life. He spent 3 months traveling around Mexico looking for just the right pieces for the home. He worked with woodworkers outside Coba, gathered lamps and textiles from Merida, and after several trips digging through discarded items and warehouses of antique hacienda furniture in San Miguel; he landed many of the unique pieces he was looking for to complete Nest. He sourced all the bedding, plants, soaps and lotions from local vendors down to buying a custom, no label Mezcal from a friend who lives in Tulum Pueblo. I heard he never stops and is continually looking for just those right pieces for the house to give it that modern, at-home feeling. Now let’s get to the top 8 things I LOVE about Nest Tulum. 1) It’s extremely romantic! Can’t think of a better honeymoon destination than this. It’s also great for busy couples who want to unwind and connect with each other. 2) Breakfast is included in the stay, and it’s one of the best breakfasts you’ll ever have! They have a big menu, but you can order essentially anything you want. My friend Hannah and I both opted for the fruit plates every morning – freshest fruit we’ve ever had – and an egg dish (my picks were the spinach omelettes and huevos rancheros). You can also get granola bowls, fresh squeezed juice, and even probiotic drinks. Anything your tummy desires. 3) It’s so quiet and intimate. Unlike other beachfront hotels in the area, the beach and facilities are only open to guests, which means it won’t ever get crowded. It feels more like a friend’s beachside home than a hotel. The ultimate spot for disconnecting from the world. It’s also a great chance to unplug since there’s no television sets or iPhone docks in any of the rooms. 5) This is an adult-only house, so you don’t have to worry about noise or crowding from families and children. 6) Not only was the huge bathtub phenomenal, but the robes and luxurious products in the bathrooms were a true treat! 7) They have bikes in the property which are perfect for exploring Tulum! 8) It’s the perfect spot if you want to do a property buyout for a retreat, wedding or any special intimate celebration. 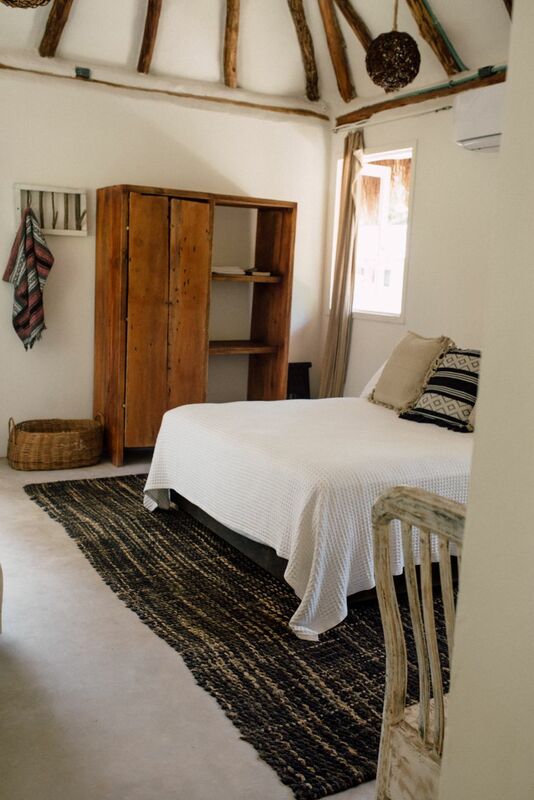 If you need a vacation to disconnect from the world, work, busy schedule, or just want to spend much-needed intimate time with your loved one, The Nest is the place to stay. You will not be disappointed. And you’ll want to come back asap.